There appears to be a big difference in the approach to workmanship between Western (i.e., European/North American) boatbuilding and that of the dhow world. While the design of traditional Western working boats may have varied, from "workmanlike" to pure grace, workmanship tended to be quite high. Good enough was rarely good enough, and even the simplest and most pragmatic of working craft -- Banks dories come to mind -- tended to be built with cleanly-cut frames, nicely lined-off planks, and in general, evident pride of workmanship. This doesn't seem to have been the case among dhow builders. 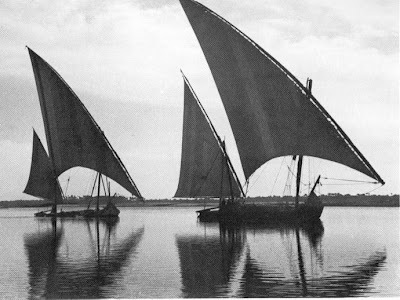 Dhow designs are often lovely, sometimes elegant: as shown in the photo of a boom above, their hollow entries tend to merge beautifully along the waterlines into rather wide, square bilges, and there's an ineffable grace to the settee sail in its great variety of rigs. But workmanship tended toward -- no, that's too kind -- let's say favored -- the crude. Construction began with the backbone (keel, stem and sternpost). Most had their planks assembled before frames were installed, being held together temporarily with external blocks or battens. No forms or moulds were used, so achieving the proper hull form required a really sophisticated understanding of plank shapes -- all the more impressive given the total absence of drawn plans. Contrary to popular belief, however, frame-first construction did occur in in many cases, with the frames being set up on the backbone, Western-fashion, before planking began. Scantlings were quite light by Western standards, but then again, the Indian Ocean isn't the North Atlantic. In either case, only the outboard surfaces of the frames were flattened or squared up with an adze -- and that done rather roughly. All three inboard surfaces of the frames were left "natural" -- i.e., in the round, with the bark still attached. A look at the interior of a dhow's hull looks positively primitive. (Framing was often done with what was called "jungle wood" which, I believe, was mangrove.) In the picture below, showing a small boom under construction, every other frame butts against the keel, while those in between use natural curves to pass over the keel from one side to the other. 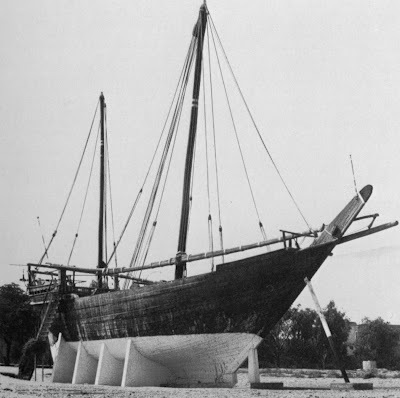 As late as the 1970s, dhows were being built with hand tools, sawing being done by hand, and drilling with bow drills. Plank fastenings were typically iron nails, driven in from the outside and clenched over into the inboard surface of the frames. 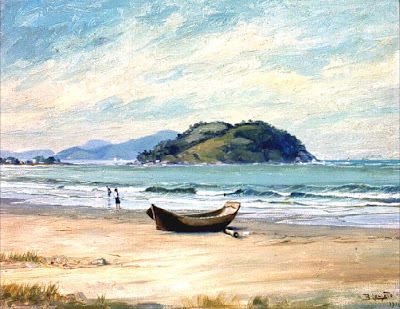 Construction often occurred on a beach with no proper shipbuilding facilities whatsoever. Launching from the beach was a strange procedure. As shown in the drawing below, logs were placed beneath the keel, and these were lashed tightly to lengths of timber laid across the gunwales, so that the dhow was held upright inside a vertical square framework at each end. 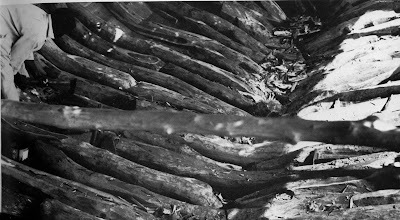 The lower logs rested on skids. Baulks of timber were suspended by ropes from the upper timbers. Shipbuilders would pull back on these baulks and then release them; they would swing forward and strike the transverse logs with a great "thunk," inching the dhow forward over the skids. The procedure was repeated as many times as needed until the dhow reached the sea. A windlass was also used to pull the vessel along. Contrary to what I said at the end of my last post, this one isn't about dhows. Because since my recent post about a couple of useful skinboat sources, I learned of another that deserves mention. 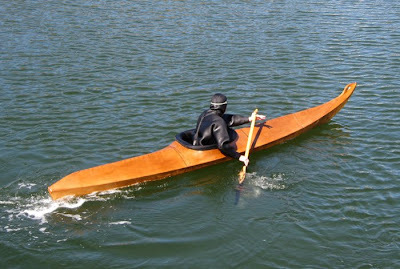 Wolfgang Brinck is the author of The Aleutian Kayak: Origins, Construction,and Use of the Traditional Seagoing Baidarka. This is a fine, nicely detailed how-to-build-it book with an unusual focus on ergonomics. Rather than including detailed dimensions of the boat that he shows you how to build, the author explains how to use the dimensions of your own body to proportion the boat to fit you perfectly. This approach is conceptually similar to that used by Indonesian canoe builders, as described here, and it was widely used throughout the world of indigenous boat building. Another nice feature of the book is its economical approach to the project: when published in 1995, the author presumed that most work would be done with hand tools rather than power tools, and he estimated building costs at under $200. Wolfgang blogs with intelligence and humor at Skinboat Journal, and teaches skinboat and paddle building, as described on his website. Good question. 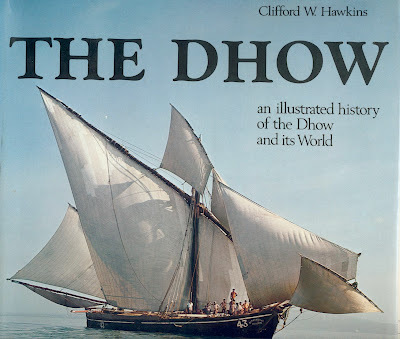 According to Clifford W. Hawkins, in his nicely illustrated book The Dhow: an illustrated history of the Dhow and its World, the term is mainly a European word that seems to encompass just about all of the medium and large indigenous sailing craft of the Indian Ocean, including those of Arab, Persian, and Indian derivation, and more lately including motor-sailing and pure power craft as well. Even before 1977, when the book was published, Hawkins interviewed dhow sailors throughout its range, and none of them used the term and few even knew it; and those who did were familiar with it only through their contacts with Westerners. That said, we can agree that it's an Indian Ocean craft and, if we exclude the modern powered types, that it has a lateen sail, right? The answer is nope on many counts. First, let's deal with that "lateen" thing. Below, we see a true lateen sail on an Egyptian felucca. 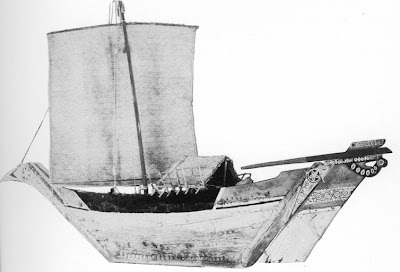 Notice how the dhow's sail is really a quadrilateral, with a short luff or leading edge, whereas the feluccas have a true triangular sail with no luff. This sail is called a settee, not a lateen. On some dhows this is very easy to mistake because the luff angles down only slightly from the line of the sail's head, but it's there nevertheless, and most easily recognized by the fact that the spar does not extend all the way to the tack or front-bottom corner. So can we then refine the definition and say that a dhow is an Indian Ocean craft with a settee sail? No again. 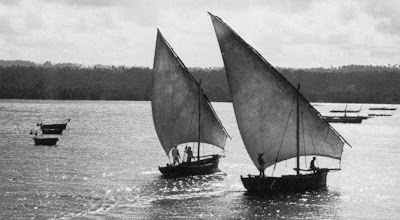 For starters, there have been dhows, so-called, with square sails, shown immediately below in the model of a mtepe, and below that in the confusingly-named dau la mtepe. The former, which had a sewn hull, is rather long extinct, while the latter survived into the early years of the 20th century. Bottom line, we probably can't come up with an iron-clad definition of a dhow, since it is a term that Europeans applied to just about all the sailing craft of the Indian Ocean, encompassing different rigs, hull forms, construction methods, and uses, and hailing from many different and far-flung lands and cultures. Best to think of dhows like seagulls -- there ain't no such bird as a "seagull," but it's a convenient cover-all term nonetheless and, even if you can't define it, most people know the group of birds, or boats, that you're talking about when you use it. 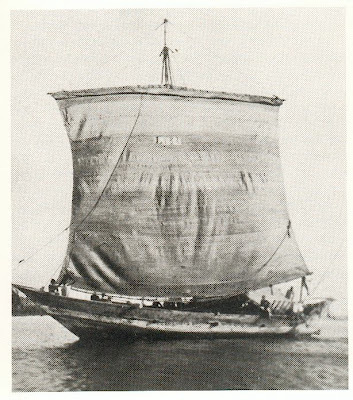 We'll look at dhows again in the next post. Harvey lives in the Pacific Northwest, and has built more than 50 replica boats in the last 15 years. Using a variety of sources, ranging from Adney and Chapelle's Bark Canoes and Skin Boats of North America to personal measurements taken on original boats held by museums, he has replicated every major type (and many of the sub-types) of Arctic kayak known -- several of them more than once. His work appears very authentic, down to the use of lashings versus pegs to hold the wooden frameworks together, as appropriate to the particular boat at hand. Of course he uses synthetic materials in place of the original sealskin, baleen, and similar restricted materials, but the end results are as accurate as can be imagined given the legal limitations and ecological considerations involved. 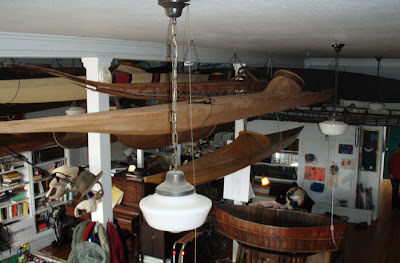 Harvey has kept a great many of the kayaks he's built, and keeps them in the old corner grocery store that constitutes the first floor of his home. From the photo below, which I'm using by permission, it seems to be quite a sight. Harvey's research has led to the publication of KAYAKS OF GREENLAND: The History and Development of the Greenlandic Hunting Kayak, 1600-2000, which I haven't yet had the pleasure of seeing, but which I've heard compared favorably to Adney's work on bark canoes. And Harvey is working on two follow-up volumes, on Alaskan and Canadian kayaks. Look over the website of this self-directed, masterful authority. You'll be amazed. He lists every boat he's built, the documentation he used as source material, includes photos of many or all of them (including construction details of several), and has several useful links to other skinboat resources. A virtuoso performance! On the subject of skinboats: another important source is Skinboats.org, where you can buy just about any kind of construction material, information, or training for building your own skin-on-frame kayak, baidarka, traditional-style kayak paddle, pulling boat, umiak, or "zoomiak" -- a clever variant on the modern hard-bottom-inflatable boat using a skin-on-flame foundation for the inflatable collar. Sad times in Brazil, with firm evidence of the Airbus crash just emerging. But Brazilian correspondent Silvio Antunha sends information about an artist who documented the wonderful dugout canoes of his country. 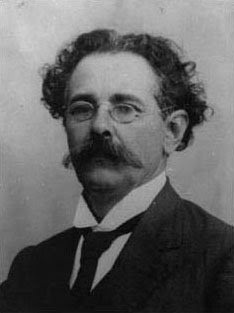 Benedito Calixto (1853-1927) was Silvio's grand-uncle on his mother's side. Silvio sent several pertinent links, all in Portuguese, but well worth checking out even if, like me, you are afflicted by "American's Disease" and can't do anything but English. The first of the links above, from which I borrowed the painting at the top of this post, has some formatting problems, but if you move your cursor carefully along the right-hand column of thumbnails, you'll eventually find the links to larger images. (No problems with the left-hand column.) The image of the artist himself, below, is from the Wikipedia site. Silvio points out that the artist's name translates as Sacred Goblet (i.e., Holy Grail?). http://www.youtube.com/watch?v=j8yHb43wjzE&NR=1 Dugout regatta sailing action: these things seem to behave beautifully in a chop, and seem surprisingly forgiving of "bad" technique. http://www.youtube.com/watch?v=ow11ZqvMWEM Mainly a slide show with some nice images of dugout construction. The image that appears around 1:25 shows some of the nicest lines I've ever seen on a dugout.